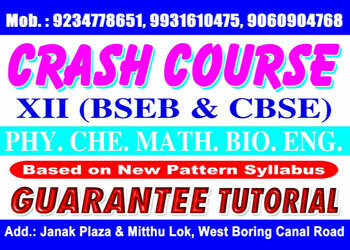 Best Science coaching for 11th and 12th Classes of CBSE and Bihar Board in Buddha Colony, Boring Canal Road, Patna. Guarantee tutorial as its name says – Guaranteed success has created a huge success records in previous years and that’s why we are ranked No. 1 in Tutorial classes for Science and Commerce for Class XI, XII. Why we are the best science coaching in Patna? Our Faculties : We are a team of highly qualified professionals who have a vast experience in education. Their experience and success ratio is the advantage for students. Our Teaching Methodology : You can find a number of coaching institutes for science and commerce preparation in Patna. List will be very long you can’t imagine. Opting right one is very difficult today. Our teaching methodology differentiates us among other science coaching institutes in Patna, Bihar. Our faculties make sure the basic concept of Math, Physics, Chemistry and Biology subjects must be easily understandable to our students. Best Study Material : Previous years question paper patterns and improved study material prepared by experts ensure success in 11th 12th exams of CBSE, ICSE and Bihar Board exams. Study and competitive environment : At guarantee tutorial Patna, our admission team examine each students before admission. Our staff always insist on educational environment with competitive nature in our premises. Regular tests and ranking programs enlighten students mind towards success and better understanding of science subjects and commerce curriculum. Top Class Infrastructure : Guarantee Tutorial teem ensures every required facilities like AC classrooms, pure drinking water, cleanliness and social healthy environment in campus. Huge Success Records : Our previous years success records have proved us to be the best science coaching in Patna for classes IX, X, XI, XII etc. If you think your dreams mean a lot and want to transform it in the real world, take admission in this science coaching for class XI & XII in Patna soon and give wings to your will. Pick up your little box and dial 9931610475, 9801293121 for reaching us or, see our site at Janak Plaza, West Boring Canal Road, Near Udayan Hospital, Patna 800001.